Again, I meet you with my blog and maybe I should not show up my name here since The Japan Foundation blog has a new interface with my cute avatar in your right hand site corner. Hey Nunzia, I saw the Animation Character Exhibition in your blog. It is so fantastic that the exhibition was extended in one week for the audience. Do you know that we will have this exhibition in Vietnam next year? I do hope that there will be some other interesting stories about this kawaii exhibition in Vietnam next year in our blog. Since my last entry in September, there were many activities in Hanoi that I would like to attach with in this blog. It is a challenge for me to miss telling you any of activity. However, still, I have to make up my mind. This time, Karin Quartet Music Concert, and Norwegian Wood Premiere will be your blog menu. 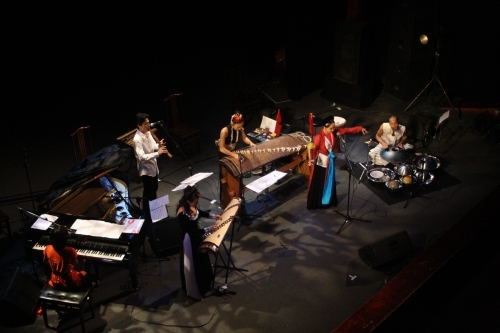 For the first time, Karin (koto) and other three musicians Akihito Obama (shakuhachi), Mami Ishizuka (Piano, vocal) and Aki-ra sunrise (percussions) had joined together as Karin Quartet and traveled around the southeast Asia. Hanoi, Vietnam is their third destination after Lao and Cambodia. 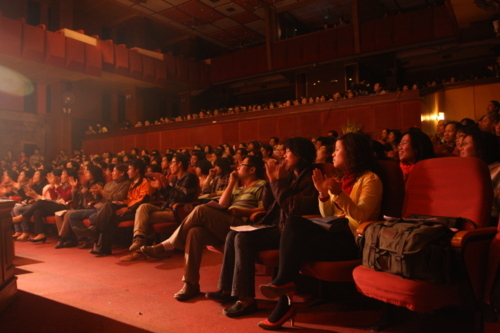 For the Japan Foundation in Hanoi, this is the very first time to organize such a music concert. Especially, there were two collaborated performances with Vietnamese musicians in the program suggested by our Deputy Director Mr. Yoshioka. After all considerations, with the support from Mr. Do Bao, a famous music composer and music arranger, we finally invited Ms. Vanessa Van Anh Vo (dan tranh, 16 strings) who stays in the USA, and Ms. Thu Huyen, one of the top Cheo singers in Vietnam to join with Karin Quartet in two nights performances. 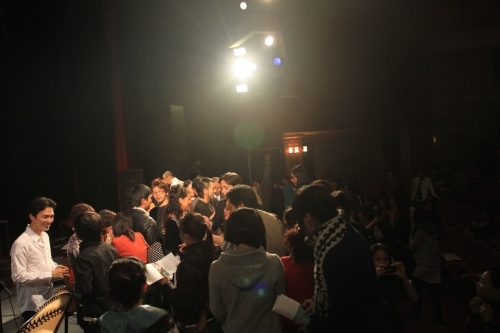 We welcomed more than 900 audiences in two nights. I wish you could be in the theatre to see how the audiences were excited after each performance and crazy with Akira Sunrise when he played the djem (a drum from Africa) and beat box in the song titled “Spain”. 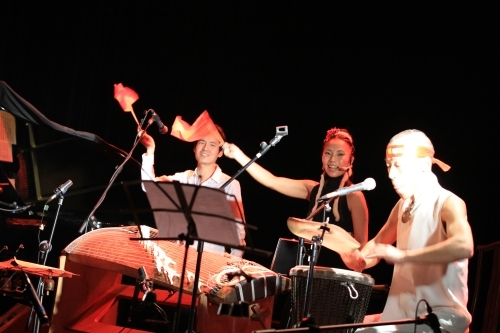 Karin Quartet encouraged the audience to join in the last two performances with “Chakkiri-bushi” and “Longyi and the sun” by singing along in chorus, and clapping hands with the music rhythm. 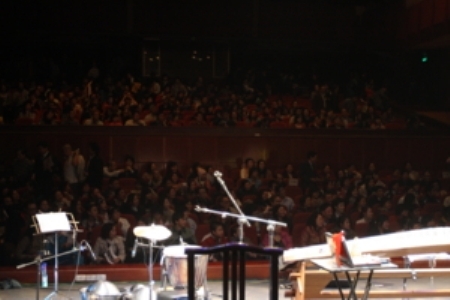 In the encore, audience sang along with the musicians the song “Umi” (The sea), which translated into Vietnamese by Mr. Do Bao. It should be my mistake if I did not tell you one special gift of the Japanese musicians for Vietnamese audience in the second night. After the first performance, the musicians met some traffic jam on the way back to the hotel since there were many people with flags and motorbikes around the streets. They were told that Vietnam won over Singapore in a football match that night. 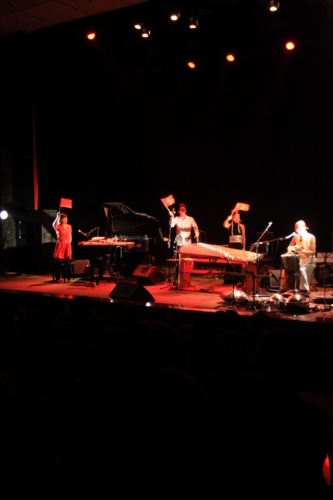 The musicians bought some small Vietnamese flags and some head bands titled “Viet Nam vo dich” (Vietnam-the winner). Next day, in the middle of the song “Spain”, Aki-ra sunrise suddenly but slowly in silence wore the head band and play the drum excitedly while the other three waved the flags like the way Vietnamese people did the night before in the street. The theatre became so hot with the clapping hands and shouting. Please see the photos below. Mr. Dang Nhat Minh, the famous film director, told me that “Since the Japan Foundation office has established in Hanoi, there are many activities for Vietnamese public audience to approach Japanese culture. Organizing programs that are interesting and close to the public audience is one of the specialties of The Japan Foundation in Hanoi. For this time, I am impressed with the collaboration performances. I hope there are more collaboration performances between Vietnamese artists and Japanese artists not only in music but also in other fields of art.” Ms. Vanessa Vo Van Anh, who experienced in many collaboration sessions with international artists, really appreciated the talent of Karin and Quartet. She could not imagine that they can improvise with two days practice. “What professional musicians!”, she said. Well, believe me, they are not only that talent. They are so nice and humble as well. They remind me of Director Tran Anh Hung and his film “Norwegian Wood” in the premiere night one week ago, on 22nd of December, 2010. 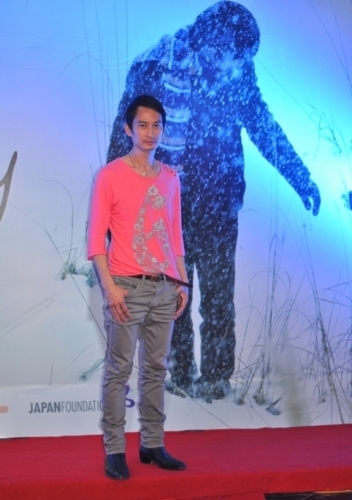 Actually, the Japan Foundation decided to support for Norwegian Wood premiere in Hanoi or to invite the main actor and actresses from Japan. Unfortunately, our invitations reached them when they have already had other plans at the same time. But still, the supporting plan for Norwegian Wood premiere was implemented as planned. As explained in Tuoi Tre Newspaper (http://tuoitre.vn/Tuoi-tre-cuoi-tuan/Van-hoa-Nghe-thuat/416529/%E2%80%9CToi-khong-deo-kinh-chong-nang-o-Viet-Nam%E2%80%9D.html), Mr. Norihiko Yoshioka, Deputy Director of the Japan Foundation in Hanoi considered Norwegian Wood is one of the opportunities for the Vietnamese people to get to know and see Japanese culture through Tran Anh Hung’ eyes. The premiere was warm and closely with the way Tran Anh Hung welcomed his friends, press and guests. 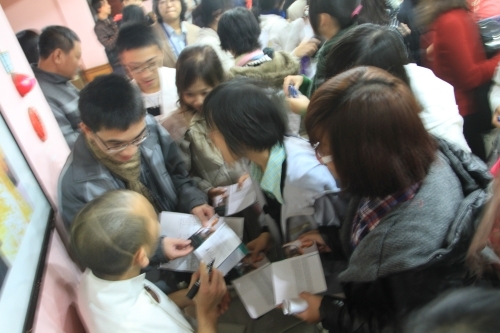 He had no hesitation to talk with guests and kept waiting until the end of the movie to say thanks to the audience just outside the door of the theatre. So, let’s enjoy Norwegian Wood to see how Tran Anh Hung depicted Japanese culture in his movie! Thank you for your time, especially Mio-san, who always translates my long blog patiently.